Instagram is a popular application to share your images with friends through worldwide(no need to say more about Instagram). Instagram application currently available for both iOS or Android devices. But there is no official version for your computers. Pokki released Instagrille 2.0 desktop application for Windows computers which is very similar to Instagram. 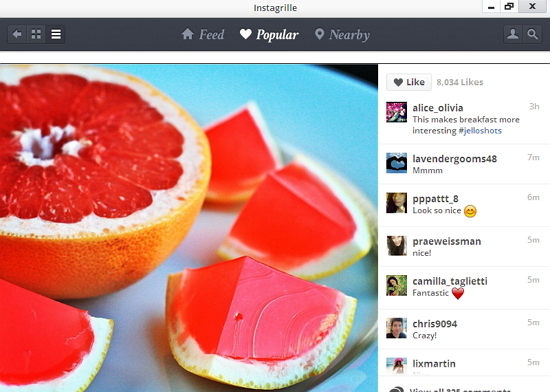 Instagrille offers favorite Instagram features including feeds, profile views, comments and ‘likes and more. Users can can search, share and download photos from Instagram directly on your windows computer with Instagrille desktop application. Instagrille desktop app now supports Windows XP, Vista, Windows 7 and Windows 8 but in desktop version currently you cannot upload any image from your computer.